Recognizing the successes of treed Gaussian process (TGP) models as an interpretable and thrifty model for nonparametric regression, we seek to extend the model to classification. Both treed models and Gaussian processes (GPs) have, separately, enjoyed great success in application to classification problems. An example of the former is Bayesian CART. In the latter, real-valued GP output may be utilized for classification via latent variables, which provide classification rules by means of a softmax function. We formulate a Bayesian model averaging scheme to combine these two models and describe a Monte Carlo method for sampling from the full posterior distribution with joint proposals for the tree topology and the GP parameters corresponding to latent variables at the leaves. We concentrate on efficient sampling of the latent variables, which is important to obtain good mixing in the expanded parameter space. The tree structure is particularly helpful for this task and also for developing an efficient scheme for handling categorical predictors, which commonly arise in classification problems. Our proposed classification TGP (CTGP) methodology is illustrated on a collection of synthetic and real data sets. We assess performance relative to existing methods and thereby show how CTGP is highly flexible, offers tractable inference, produces rules that are easy to interpret, and performs well out of sample. This work was partially supported by Engineering and Physical Sciences Research Council Grant EP/D065704/1. TB’s research was supported by a Marshall Scholarship. We would like to thank three anonymous referees, whose many helpful comments improved the paper. ASUNCION,A., and NEWMAN,D.J. (2007), ”UCIMachine Learning Repository”, School of Information and Computer Sciences, University of California, Irvine, http://www.ics.uci.edu/~mlearn/MLRepository.html. DIMITRIADOU, E., HORNIK, K., LEISCH, F., MEYER, D., and WEINGESSEL, A. (2010), “e1071: Misc Functions of the Department of Statistics (e1071), TU Wien”, Version 1.5-24, CRAN repository, maintained by Friedrich Leisch, obtained from http://cran.r-project.org/web/packages/e1071/e1071.pdf. GRAMACY, R.B., and TADDY, M.A. (2008), “tgp: Bayesian Treed Gaussian Process Models”, R Package Version 2.1-2, http://www.ams.ucsc.edu/rbgramacy/tgp.html. GRAMACY, R.B., and TADDY, M.A. 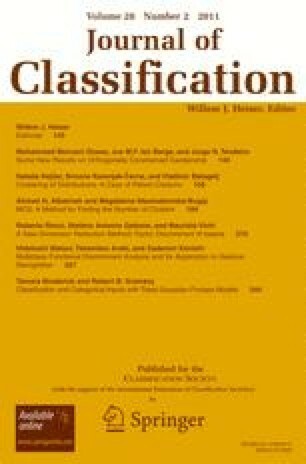 (2009), “Categorical Inputs, Sensitivity Analysis, Optimization and Importance Tempering with tgp”, Version 2, an R Package for Treed Gaussian Process Models, University of Cambridge, http://www.cran.r-project.org/web/packages/tgp/vignettes/tgp2.pdf, submitted to the Journal of Statistical Software. RIPLEY, B. (2009), “Feed-forward Neural Networks and Multinomial Log-Linear Models”, Version 7.3-1, CRAN repository, maintained by Brian Ripley, obtained from http://cran.r-project.org/web/packages/nnet/nnet.pdf. R DEVELOPMENT CORE TEAM (2008), “R: A Language and Environment for Statistical Computing”, R Foundation for Statistical Computing, Vienna, ISBN 3-900051-00-3, http://www.R-project.org. THERNEAU, T.M., and ATKINSON, B. (2010), “rpart: Recursive Partitioning”, Version 3.1-46, CRAN repository, maintained by Brian Ripley, obtained from http://cran.rproject.org/web/packages/rpart/index.html.